Here are some tasty Amish Friendship Bread Cake Pops. These can be made with any amish friendship bread or any cake mix. Everyone loves cake pops. 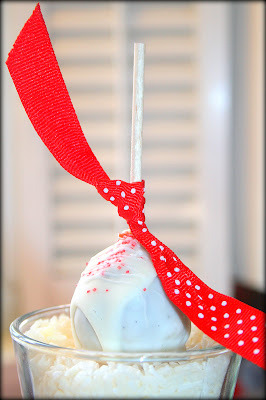 Kids and adults of all ages love these cake pops! Decorate them to suit any theme–baby or bridal showers, birthday or office parties–anything goes! Completely cool (4 hours or overnight) any Amish Friendship Bread variation. Roll into bite-sized balls and place on baking sheet. Stick in lollipop sticks and put in freezer until firm, about 30-40 minutes. When cake balls are firm, melt chocolate in melting pot, double boiler or microwave bowl. Dip each ball into the chocolate until covered and gently tap off excess chocolate. Stick into Styrofoam to keep lollipops upright. Variation #2: Cake Ball. The quickest method for bakers on the run! Don’t stick lollipop sticks into cake balls. Once firm, use two forks or a toothpick to dip cake ball into melted chocolate and another toothpick to push ball off onto aluminum foil. Use extra chocolate to cover the top where toothpick was inserted. Decorate. Thank you Crystal! Thank you Sarah. Sarah I just saw it pop up on twitter & pinterest. I'm now following you back! Thanks much.